Simply the best you will find in Queensgrant! Newly furnished, newly tiled, just painted and well equipped. Our 2000 square foot villa will blow you away. We can house one large family or two small ones. 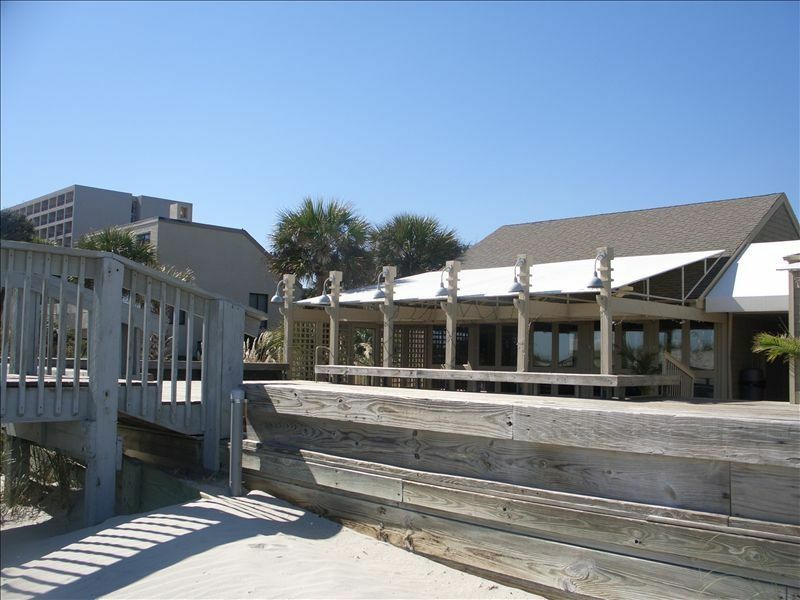 We are in the Palmetto Dunes Plantation, just a few minutes walk from the BEACH. Our location is convenient for golfers, as we are located on the Robert Trent Jones Course,(one of the top 100 courses in the world) and very close to many others. Hilton Head is the ultimate Golfers Dream Come True. Hilton Head Island a regular stop for the PGA Tour (with the Heritage Golf Classic on the island each year.) Of course we have the beach, but we also have boating, miles of SAFE bike trails, horseback riding, outlet shopping and much much more. The Island has something for everyone, both young and old alike. Please give us a call to further discuss your next family vacation. Now available is our new Dunes Buggy service with free local transportation throught the Palmetto Dunes Plantation and Harbortown too! This Property is owned by the Nelson Family. We love it for our family and know that you will too. We have been coming here with our children since they were infants. Our unit is great for one big family or two small ones. We wanted to have a great place to visit now and somewhere nice to retire. Our villa is large and comfortable and it is just a few minute walk to the beach. We enjoyed our time at the beach and pool. Pool was older looking but was a pool and kept us cool. Condo was older and dirty, we had to vacuum out the sleeper sofa because it looked like bugs from a distance but actually just crumbs or dirt. We also vacuumed the chairs because of the stuffing or what ever it was by/under the cushions. We had to wash all linens because we weren't sure if they were clean for example the sheets in the twin bedroom had dried blood on them and the pillow cases in the master bedroom had stains as well. We actually bought new pillows to sleep on. . The towels on the beds seemed ok but when you saw the ones under the counter in the bathroom.it was so dirty we wanted to wash them. The cabinets in the whole unit seemed sticky from lack of cleaning and the utensils and pots and pans had to all be washed before use. Our feet were black from the dirty floors. The medicine cabinets were filthy and we all just used our suitcases for our drawers because it just wasn't up to our standards as clean. We also did not have a working dishwasher so yes that is right we had to hand wash everything. So FUN! As for the heat, when we arrived it was so cold we loved it. Day two and three and four it was about 85 if not hotter. We contacted owner who said it was normal but it definitely was not. She did send out her air conditioning guy who said there was nothing wrong and she then said that with it being hot in Hilton Head it was normal. We have stayed in Hilton Head for the past five years same time frame and we have never had this issue. Talked to a lot of locals and they said she is wrong and needs to update her air conditioning unit. The girls upstairs had to sleep downstairs because you could hardly breathe upstairs. If you sat with lights off and did not cook a meal you would remain somewhat comfortable I will say the last two days because we ate out and did not stay in the unit until 10pm we were able to keep it cooler. It was never the temperature you would recommend on a beach vacation. We contacted owner first who didn't help and then VRBO who did try and help us. All is documented via phone call, text messages and pictures. We want a refund and would never rent from this owner again. The two stars are for property, people at property we met and the dunes buggy. They made our stay happy. Unit would have received 1 star. We came in to the home at night, and weren't sure what we thought. By the end of the week, we didn't want to leave! The living room chairs and sofas were great for relaxation, which we sorely needed, if a little weathered. The king bed (it was only my boyfriend and me) was supremely comfortable. The kitchen had everything we needed for "home"-cooked meals, as we were trying to save money. Although it rarely got above 60 when we were there, the cottage is a great base to explore the area. As other reviewers mentioned, it's near kayaking, biking, walking trails and the beach. There was nothing like brewing a cup of coffee in the morning and chilling while looking out the picture windows into the greenery around the back patio. Although there were other condos all around, we rarely heard anyone else. My family of 7 stayed here for vacation in July and was pleased with the amount of space and comfortable beds at this ground level condo. It is very close to the general store and swimming pool, with bike and kayak rentals also close by. The awesome beach is a 10 minute walk away. Liked the large patio out back to enjoy our morning coffee. The large kitchen provided everything you need to make breakfast, everything was clean. Large 60" flat screen TV with cable was nice to have at the end of the day. In fact there is a TV in every bedroom and internet worked well for the kids. It was quiet at night, great place for some R&R with lots of walking trails and nature right outside the door. The owner was prompt to respond to any inquiries, I would definitely come here again. Our active, sports-oriented family of 6 had a fantastic time in Hilton Head and we thoroughly enjoyed our stay at this beautiful, clean and spacious condo.The kitchen and dining areas were perfect for our evening meals and the bedrooms are comfortable and private. The nearby, highly-rated tennis facility is featured in Tennis Magazine this summer (July/Aug 2013) and the surrounding pools are refreshing after a day at the lovely beach. Everything, including bike rentals, kayak rentals, the beach and the corner store is a short walking distance away from this lovely home. The owners were easily accessible and the rental process was effortless. We found the best place for our vacation this year! This Queens Grant villa is very spacious inside with an oversized deck outside! The villa is just steps away from a beautiful beach, fabulous tennis courts and incredible golf courses. We spent a month here and enjoyed every minute of it. We especially enjoyed the many happy hours, terrific restaurants, and cycling miles and miles on the bicycle path. It’s obvious that the owners take pride in creating a nice and comfortable home for you. The villa is very clean and well decorated with any and every amenity you would need. We would highly recommend this rental to anyone who is interested in a fabulous Hilton Head vacation. Nice Place, Good Location, Great Week! We enjoyed our stay over Thanksgiving. Villa was nicely decorated and the kitchen was well-stocked with everything we needed to cook our Thanksgiving meal. Quiet area, but close enough to everything. We would stay here again. Thank you for making our vacation a memorable one! Our property is in Palmetto Dunes so it has axcess to the Dunes Buggy. This is a free service that allows our guests to travel anywhere in Palmetto Dunes as well as Shelter Cove. You can get to several restaurants, beauty shops and the grocery store. This way you do not need an extra car when someone in your party is golfing or enjoying another part of the Island. When you go out our back door one block to the left you will find the General Store. Just across the street is the Bike Shop and one block to the right is a Queensgrant Pool. Behind the General store is a great pool that is for the Palmetto Dunes guests. We are a block away from the Trent Jones Golf Course as well as the Tennis Courts. Hope this helps.